Show created in februar 2015 at the Scène Nationale 61 in Alençon, then on tour (Saint-Médard-en-Jalles, Le Carré Les Colonnes ; Paris, Cité de la Musique ; Arras, Théâtre d’Arras ; Metz, Arsenal de Metz ; Chateaubriant, Théâtre de Verre ; Noisiel, Ferme du Buisson ; Lyon, Chapelle de la Trinité ; Noirlac, Abbaye de Noirlac, etc). On tour again in 2016. Coproduced by la Scène Nationale 61 and l’Arsenal de Metz with the support of the ADAMI, the CNV, FCM and of the SACEM. With the support of the Rouen-Haute-Normandie Opéra for the set. The first time I listened to the demo recording of Love I Obey, to me it conjured up Renaissance ballads being sung by the fireplace in an old castle in Ireland by a Mélisande, gazed at intently by musicians dreaming of distant horizons . . . or perhaps the softness of her skin. Like an Elizabethan fado, it was a music that was both precious and poetic, infused with the sea spray. This new exploration by Rosemary Standley accompanied by musicians specialising in baroque starts with Purcell and then crosses the ocean to other lands of folk music, tracing a surprising musical itinerary in which melodies that are centuries apart seem contemporary to each other. A bit as if Marilyn Monroe in River of No Return had stepped from her raft and started to sing a song from Shakespearean – one of the sonnets, perhaps, put to music – as if it were the most natural thing in the world; or as if the musicians had emerged from an old galleon like the one found washed up in the jungle in One Hundred Years of Solitude. Indeed, these songs are often about solitude, of thwarted, impossible or lost love, without it being necessarily a cause of suffering; there is also happy expectation, hope and cheer, the joy of a first kiss. “Love I obey,” like a grave and beautiful command, conjuring both fate and pleasure, both a dreamy narcissism and a sense of selflessness. Rosemary and her musicians bring out these fragments of a lover’s soul. 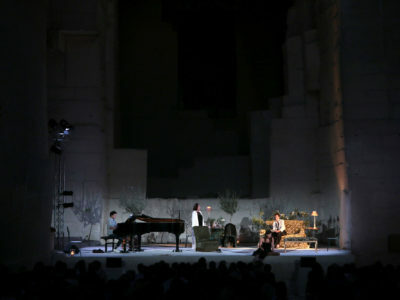 It is the director’s role to accompany them, to play with the colours and gestures that are already a part of the performance, and to pluck out of the air a word here and there that perhaps count a little more than the others, and make them resonate on the stage, at the heart of this poem that puts you in the mood for love. 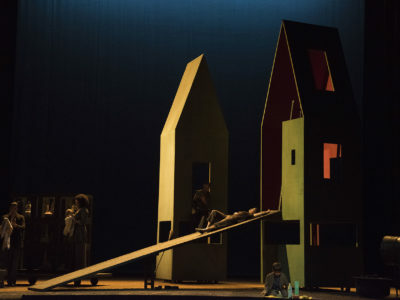 The staging does not set out to construct a narrative, but rather to accompany Rosemary and her musicians in their exploration of a world that is both familiar and imagined, sometimes grave, in which each character is inhabited by memories and desires that come to surface throughout the show. In the beginning they arrive slowly, from a long way away, for a funeral, perhaps, for something out of the ordinary that has brought them together in a shared melancholy, and they gather rather religiously around a small lamp, in a corner of the stage, as Rose sings a first song, like a prayer, belted up in a great raincoat and accompanied only by Bruno on the guitar. There is silence, silhouettes passing by, and then there is Elisabeth, the other woman, perhaps Rose’s sister, who decides to go and sit at a harpsichord, which we see all of a sudden, and who begins to play, alone, just for herself; and with this music, life picks up again, little by little, and the stage begins to transform: a painted backdrop slowly descends, depicting a forest, a new-world landscape, the kind of painted canvas backdrop you don’t see any more but that’s been well used, that you might put in a very small opera or even a saloon. A few pieces of furniture, and the musicians who can’t take their eyes off these two women whose story we’ll only get a glimpse of, and so we continue to wonder where they come from and where they are going: their dresses conjure up the Empire period and Joséphine’s island birthplace, but also, perhaps the United States in the 1950s.